Imagine turning a mere point of light into a real world! That is what Target Asteroids! observers do when they submit images and data to the OSIRIS-REx mission’s citizen science program. These observations allow the OSIRIS-REx science team and other planetary scientists to better understand our target, Potentially Hazardous Asteroid (PHA) (101955) Bennu, and the entire Near-Earth Object (NEO) population, too! This Professional-Amateur or “ProAm” collaboration builds on the tremendous foundations of amateur astronomy – throughout history, amateur and professional astronomers have made exciting discoveries, collaborated to learn more about the cosmos, and teamed up to provide details about the Solar System. What could be more exciting and rewarding than that (other than seeing a returned sample in hand)!? Target Asteroids! (TA!) 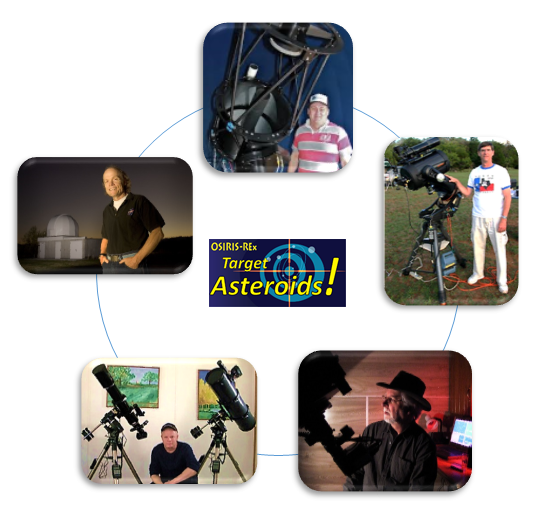 is a pro-am-citizen science program that engages amateur astronomers to observe particular asteroids through special campaigns by providing images and making measurements of brightness (photometry) and position in the sky (astrometry) over the course of their orbits. TA! was established in 2012 as part of the OSIRIS-REx mission as a partnership between OSIRIS-REx science and communication and public engagement. Like many team members, we (Carl Hergenrother and Dolores Hill) have our roots in amateur astronomy and still love the night sky. So it has been a great joy for us to work with amateur astronomers from all over the world and celebrate their successes. Why do we care about asteroids? Scientific inquiry and the threat of asteroid impact know no geographical boundaries. OSIRIS-REx Target Asteroids! citizen science is one step in the right direction toward harnessing the talents of experienced, serious amateur astronomers and also promoting STEM-related activities and learning for citizens both in and out of school; yet another way that OSIRIS-REx Secures Our Future. The benefits of the Target Asteroids! citizen science program extend to all of humanity, now, and in the future. 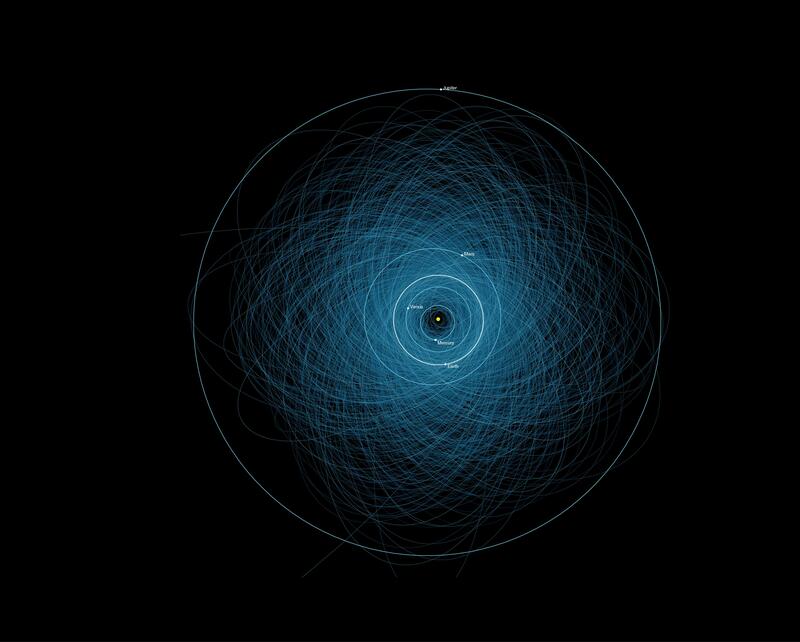 Asteroids in the Crosshairs: So many… so little time! So one may ask, what is on this list of important asteroids? Carl Hergenrother, OSIRIS-REx science team astronomy lead and Target Asteroids! co-lead, selects both Main belt asteroids (MBAs) and Near-earth asteroids (NEAs) that are thought to be carbon-rich like Bennu, the OSIRIS-REx target, are possible parent asteroids to Bennu, and give insight into asteroid characterization and dynamics of NEA orbital evolution. Many of the asteroids do not have any information known beyond their original discovery! Few of the more than 678,000 asteroids have been fully characterized because many are faint and astronomers can only study a few at a time. 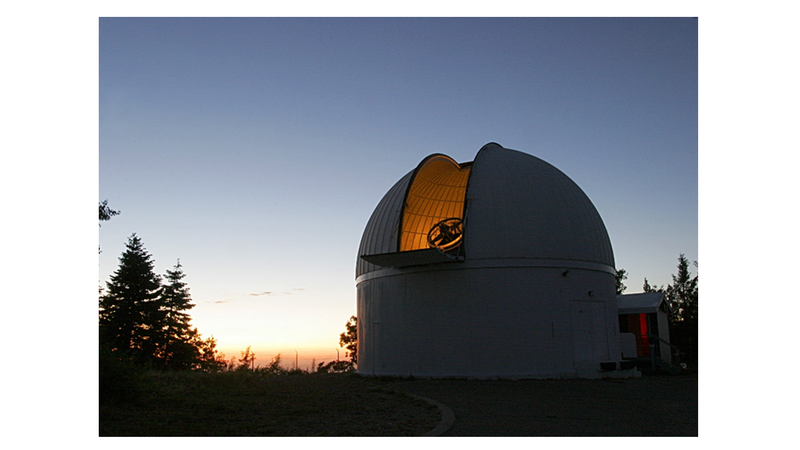 They use large aperture telescopes with sophisticated instrumentation such as photometers outfitted with special calibrated filter sets and spectrometers. In addition, opportunities like close flybys of asteroids of the earth-moon system are too good to pass up. Optical telescope observations are conducted to support radar observations by the Goldstone Radio Telescope in California and the great Arecibo Radio Telescope Dish in Puerto Rico. Target Asteroids! observers are at the forefront. Because these NEA’s are moving so fast observers sometimes have to set up ahead of the path to catch a glimpse and take very short exposures typically only 5 seconds long! Several famous flybys have been observed by Target Asteroids! observers. The most recent one was 2004 BL86. (See images). TargetAsteroids! observer Alberto Quijano Vodniza took 5 second exposures at about the same time from Columbia! Who are these citizen scientists? Almost 300 observers come from all walks of life and are located all over the world on every continent except Antarctica. Some use relatively small telescopes and some employ much larger apertures. They have contributed images and data for more than 71 near-Earth objects (NEOs) in need of characterization and more than 419 Main belt asteroids. I can’t tell you how exciting it is to see the observations as they come in and we get to know each observer! In the true spirit of international scientific cooperation, they help each other with observing tips and share the excitement of observing the same asteroid from different vantage points. Even better is when they are able to visit OSIRIS-REx in Tucson where Dante, Ed, Carl and I can thank them in person. Although we can’t list all of our observers here, we can highlight a few dedicated observers like John Briol in the frozen terrain of Minnesota, Scott Donnell in Colorado and Perry Arts in New Jersey who brave winter weather and give their time, energy and expertise to join forces with others doing the same. Younger observers make sacrifices to squeeze in their observing at night while attending school or working day jobs. Older ones finally have time to devote to the love of their hobby… and now turn to serious pursuits. Intrepid observers Marcos Santucho, Alberto Quijano Vodniza and Paul York provide coverage from the southern hemisphere while Alessandro Odasso, Jose De Queiroz, Markku Nissinen and Dave Storey observe from Europe. Some observers like Luis Martinez in Arizona and Patrick Wiggins in Utah seem to never sleep – not only do they observe asteroids all night long on most clear nights, they serve as OSIRIS-REx Ambassador and Solar System Ambassador in daylight hours, too! While such serious observing tends to be a solitary endeavor, observations are collected and combined from an army of observers at different locations with different equipment. Many low precision observations are combined by Carl Hergenrother to produce higher accuracy than possible with a single observation (see asteroid (142) Polana for example). So every observation is important. Bad weather, equipment problems and time constraints plague professional astronomers and can be a problem for amateur astronomers, too. This prevents complete coverage of all “phase angles” or observer-asteroid-sun angle for a given asteroid as at races along its orbit around the sun. 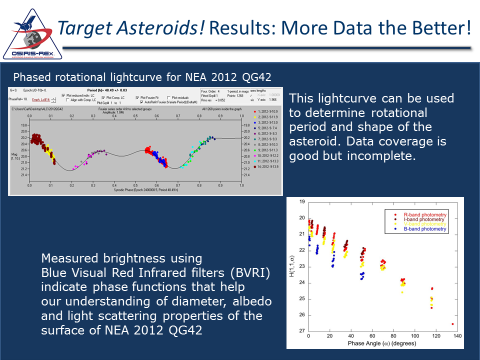 Several observers have discovered brand new, never-before-known asteroids in their images of Target Asteroids! objects. It pays to scan the entire image! Peter Lake is one such observer. He lives in Australia and observes remotely with his telescope located in New Mexico. What a setup!? He takes full advantage of this arrangement by conducting observing sessions in the comfort of school rooms and public events. He mentored a whole classroom of gifted students at Yarra Grammar School where each student learned how to use special software and submitted measurements to Target Asteroids! Once per year we conduct a month-long “asteroid measuring campaign” with the International Astronomical Search Collaboration called the IASC-TA! Campaign. This gives amateur astronomers and students who don’t own sophisticated equipment or might live in light-polluted areas an opportunity to contribute to Target Asteroids! by measuring positions and brightnesses of asteroids on images provided by large professional observatories. Because not every smudge or dot is an asteroid, this successful program introduces amateur astronomers to the world of asteroid identification as they learn to distinguish a cosmic ray or hot pixel from an asteroid. It is more difficult than it sounds when those “dots” in the image are very faint. This year the Lunar and Planetary Laboratory’s Catalina Sky Survey joined the effort and included asteroids on the Target Asteroids! list in their observing program. Leaving observational legacies brings to mind master observer from Denmark, Tycho Brahe (1546-1601) and German astronomer Johannes Kepler (1571-1630). Tycho made careful, precise observations of the planets over many years and faithfully reported exactly what he saw; even positions that seemed out of place. This allowed Kepler to figure out that the planets move in elliptical orbits around the sun; not complicated series of circles. It was a truly revolutionary new idea. Comprehensive and consistent Target Asteroids! images and data have the potential to make significant contributions to our understanding of asteroids. How big are the asteroids we see as “points of light”? What is their inherent reflectivity (albedo)? How about light-scattering properties of the surface? Where do they fit in taxonomy schemes? How many of what types exist? How do they relate to meteorites that have actually struck earth? What is the size distribution of asteroids? Which asteroids belong to “asteroid families” that suffered collisions in the past? What is Bennu’s real parent asteroid and how did the family evolve? These carefully made observations could help astronomers measure the Yarkovsky effect (change in orbit from absorption and re-radiation of solar radiation) or the YORP effect (change in rotation speed from absorption and re-radiation of solar radiation) that is very minute but builds up day after day over many years. To citizen scientists: you are valued, enthusiastic and dedicated partners whose valuable observations and data enable science to progress. You are one important part of the whole community of science; together we can be more than the sum of the parts. Your images and report might be the only one we receive for a particular asteroid and phase angle! With enough observations we can visualize real worlds with dimensions and characteristics for hundreds or thousands of asteroids. That will have to suffice until humanity can send spacecraft like OSIRIS-REx to examine them up close and personal to verify the “groundtruth”. In the meantime, our heartfelt thanks go out to all the dedicated TA! observers around the world! Can you, please, confirm the URL of the “Target Asteroids!” (TA!) crowdsourced initiative? Is it http://www.asteroidmission.org/get-involved/target-asteroids/ or is there a shorter link? The link you listed is correct. I have added it to the post. Reblogged this on Scientific Association for the Study of Time in Physics and Cosmology.